Since the very beginning, our fight to pass greyhound protection laws has been a bipartisan effort. We are supported by lawmakers on both the right and left, and proud of this record. To me, it is a ray of hope in an age of unprecedented political gridlock. That is why we recently supported Florida legislative candidate Mike Hill, a strong conservative and founder of the Northwest Florida Tea Party. 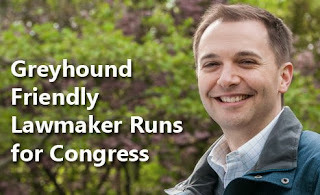 It's also why we have endorsed Carl Sciortino, an unabashed liberal state lawmaker who is running for Congress. 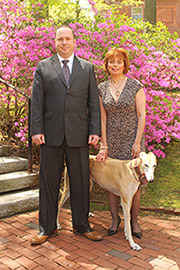 Carl and Mike may not agree on many things, but they both believe that greyhounds deserve to be protected. That is why we have stood by both of them, along with dozens of other candidates, over the years. In fact we have supported more than 100 candidates over the past decade, and our endorsed candidates have won nearly 84% of the time. There is no doubt that dog race promoters will go to virtually any lengths to protect their cruel industry. Many of these individuals are being heavily subsidized, and have a vested interest in the continuation of commercial greyhound racing. This is a fight between our people and their money and muscle, and we can only be successful by working with lawmakers who are compassionate and courageous. If you live in the 5th congressional district in Massachusetts, please vote for Carl Sciortino on Tuesday. Wherever you live, consider making a donation to Carl's campaign today so he can continue his work as a public servant. As a community, we have a responsibility to stand with the lawmakers who have given greyhounds a voice.